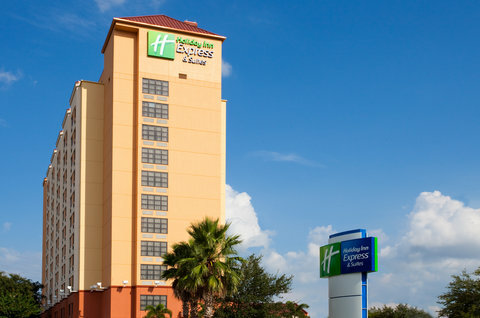 Welcome to the Closest Holiday Inn Express Hotel to Universal Orlando Just steps away from Universal Studios and merely 10 minutes from the Orlando Convention Center, our central Orlando hotel offers both comfort and convenience. If you're looking for lodging near Orlando theme parks, look no further than our charming Orlando hotel, conveniently located at the intersection of Florida&regs Turnpike and I-4. We offer easy access to several popular Orlando attractions like Walt Disney World&reg Resort and SeaWorld&reg Orlando. Cruise International Drive, also known as &regI-Drive&reg, for the best shopping, restaurants and entertainment in Orlando. Prime Outlets, Festival Bay, and Mall at Millenia are all just five minutes away. Also, we are only 15 minutes away from downtown Orlando. During your Orlando business trip, you will be impressed with the accommodations our Orlando hotel provides. From a central location near the Orlando/Orange County Convention Center, to our well-equipped Orlando hotel meeting room--complete with high-speed Internet access and accommodations for up to 50 people - our hotel near Universal Orlando&reg is the perfect place to stay during your visit to Orlando, FL. While vacationing in Orlando, enjoy several hotel amenities including free high-speed Internet access, a heated outdoor pool and our hot breakfast buffet. Book your reservation today and enjoy our great Orlando hotel deals and rates. This hotel is committed to providing accessible facilities under the American Disabilities Act. If your accessibility needs are not met, please contact the Hotel Manager on Duty. Should you require additional information regarding accessible facilities for guests with disabilities, please call 1-800-Holiday (U.S. and Canada) or contact the hotel directly. For the hearing impaired, TDD service is available at 1-800-238-5544 within the U.S. and Canada.